Sikkim is a region filled with magnificent mountains, tranquil greenery and culturally rich people. For a person who has never visited any Seven Sister States of Northeast India, Sikkim is probably the best start. Although it is the second smallest state in India, Sikkim requires at least 8-9 days to be completely discovered comfortably. One of the main reasons is because of the rough terrain that we need to travel on. The closest airport to reach Sikkim is in Siliguri, West Bengal. Here onwards, the trip to Sikkim begins. It takes about five hours to reach Sikkim and the only way to travel is by road. Due to the rough terrain, the vehicles that are best to travel in would be SUVs, jeeps or other such tough cars. Gangtok is the capital of Sikkim and is located in the east; it is relatively closer to South and West Sikkim than to North Sikkim. There are a number of hotels all over the state; it makes most of the money through tourism; therefore, people take it seriously to be tourist-friendly. I visited Sikkim in the month of November which proved to be extremely pleasant. The temperature danced around 17 °C marking just the beginning of a cold season. 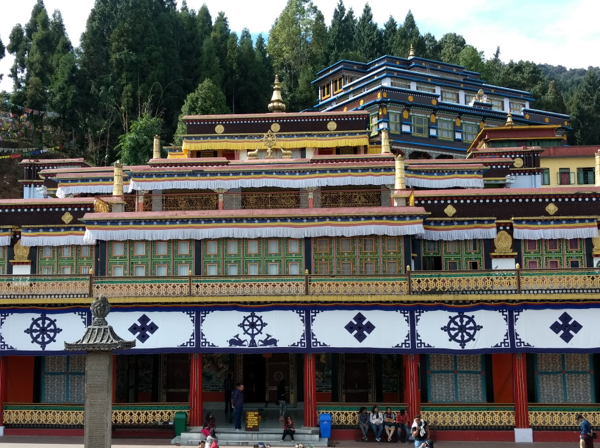 Buddhism is their main form of religion; therefore, Sikkim is filled with a number of beautiful monasteries. There are many colourful prayer flags erected all across the state because it is believed that the prayer reaches everyone when it flutters in the wind. Gangtok’s famous MG Marg is a shopping street where you find Sikkim’s trendy and fashion-conscious population. It is a beautifully structured street where no vehicles are allowed and the roads are made of footpaths with various shops lined along the sides of the street. Apart from MG Marg, major sites to visit around Gangtok would be Ganesh Tok, Tashi View Point, Bakthang Waterfall and Rumtek Monastery. Tashi View Point offers a picturesque view of the Himalayas, specifically Kanchenjunga and Siniolchu. Nathu La is a mountain pass in the Himalayas that connects India with China; it is situated in East Sikkim and is the most popular tourist location. Tsomgo Lake can be visited on the way to Nathu La; it is a serene holy site, with luscious greenery on its sides. Yak rides can be done around the lake. The journey up to Nathu La itself is so alluring, with a number of hidden waterfalls and shops selling little souvenirs. The pass offers views of the Chinese army and that of the mountains which belong to China. To enter the pass, Indian citizens need to have a permit which should be prepared in advance. On the way to Pelling, West Sikkim, Buddha Park situated in Ravangla can be visited. It is a huge and peaceful park dedicated to Buddha. Inside the temple, the story of Buddha is shown on the walls as we spiral upstairs. Sculptures of different forms of Buddha are on display all over the park. Pelling has the closest view to the Himalayan mountains and you are in luck if you find a hotel with the mountain view. Samdruptse Hill and Chardham are the religious sites to visit in Namchi, South Sikkim. Unfortunately, due to time constraints, I was unable to visit North Sikkim. But according to the locals, Yumthang Valley, Gurudongmar Lake and Zero Point Yumesamdong are some of the most popular sites to visit. If you want to experience snowy weather, visiting North Sikkim during the month of December would be the best. Apart from the splendour of the mountains, the thing I loved the most are the people of Sikkim. They are so friendly and genuinely caring in nature. I was once lost while walking back to my hotel around 6 in the evening and a gentleman walked me back to the hotel, while showing various shortcuts. It is a treat to just meet anyone from Sikkim. Recently, Sikkim was named the cleanest state of India and indeed it is true. Citizens are very conscious about cleanliness and tourism-affiliated cars have garbage bags hanging around a seat of the car. All in all, Sikkim is definitely a must-see state in India.